Most mainstream media coverage won't explain the massively lucrative nature of the Haiti venture to the US, the United Nation and Brazil. The financial interests in "their plan" for Haiti. The general spin is that the fundamental motivation of this trade initiative was humanitarian – to aid Haiti's economic development through sustainable production activity. The authorities in the US, UN and Brazilian governments won't explain that the Brazilian-headed UN troops are, by-the-way, in Haiti not only to secure the use of cheap Haitian labor for their transnational corporations, exploit Haiti's natural resources, but also to defend Brazil’s dream of becoming more of a status quo power itself and gain a seat in the UN Security Council. 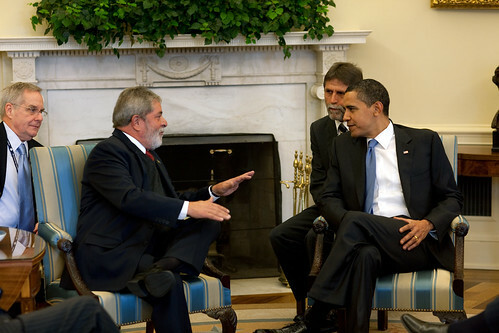 Brazilian corporations have successfully lobbied Washington and made Brazil a beneficiary under the Washington HOPE Act that allows for duty free textile goods from Haiti for 10 years. examining it..because that is too much effort and time expended (and thinking) for Black people..just leave it to the gov. and business! are they planning to squeeze out of Haiti?? really cheap looking. No, there is something else..developing the port..building big hotels..
it has to be BIG for Carlos Slim to get into it! According to Haiti Liberte only 15% of Haiti reconstruction money will go to Haitians entrepreneurs. Sounds like the Haitian business class will also be left out of the money that will be pouring in for the reconstruction.